Noida, April 11, 2019: Upon completion of an extensive Occupational Health and Safety Evaluation, Chemicals Business of Uflex Limited a leading supplier of Inks, Adhesives and Speciality Coatings, successfully migrates to ISO 45001:2018. 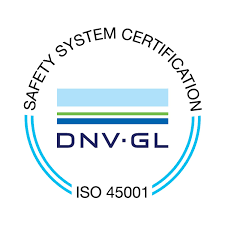 ISO 45001 is structurally an integration of other ISO Management Systems standards including ISO 9001:2015 and ISO 14001:2015 attained by the business earlier. Chemicals Business of Uflex was already in certified with BS OHSAS 18001:2007 certification and has now migrated to ISO 45001:2018. This certification further illustrates the commitment of Chemicals Business to continual growth, improving the health and safety of its employees, reducing occupational hazards and ensuring the best Quality Work Life. March 04, 2019, Noida (India): Uflex Booth at IndiaPlast 2019 captivated the attention of exhibitors, customers and visitors by showcasing a mix of innovative launches and proven products from its various businesses. 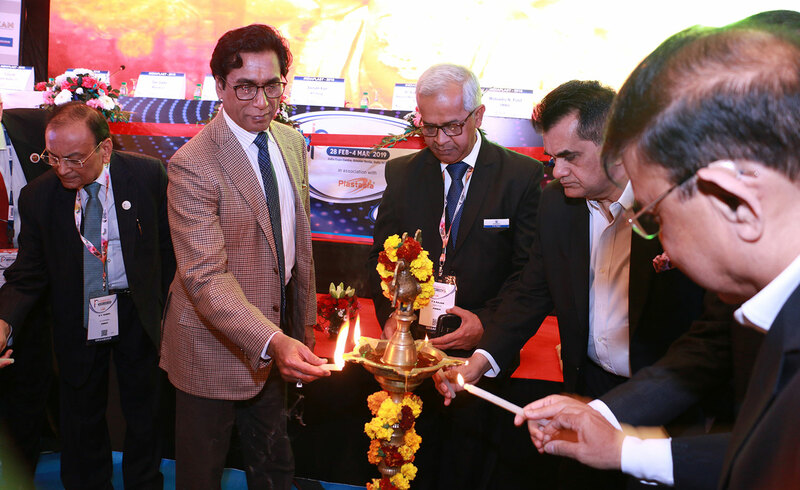 The 5 day exhibition held at IndiaExpo Centre in Greater Noida was inaugurated on Feb 28 2019 in the presence of Amitabh Kant, CEO, Niti Aayog and Ashok Chaturvedi, CMD, Uflex amongst other dignitaries and concluded today. Amongst the array of revolutionary products on display from Uflex, what became the centre of interest at IndiaExpo was a Live Demonstration of Uflex Recycling Machine at the Green Pavilion of PMMAI. The pavillion showed how Multi-layer Packaging (MLP) Waste is recycled into pellets through a fairly simple method. The subsequent process of pellets being manufactured into useful Industrial & Household Products was showcased simultaneously. Essential products manufactured from recycled pellets like benches, floor and wall tiles, ladder etc. were displayed at the booth highlighting how multi-layer plastic waste can not only be recycled, but also re-used. 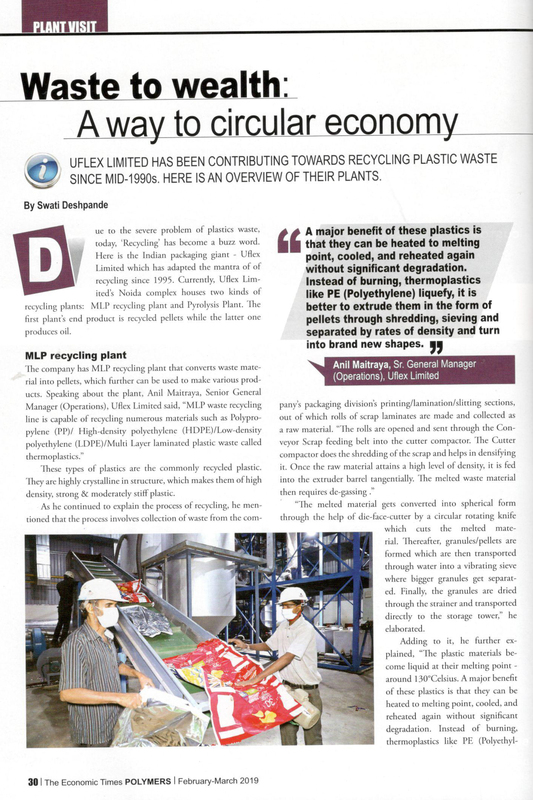 December 19, 2018, Noida (India): Primary Packaging plays an important role in the pharma industry, where its purpose ranges beyond providing barrier protection to creating unique brand identity, brand protection and patient communication. 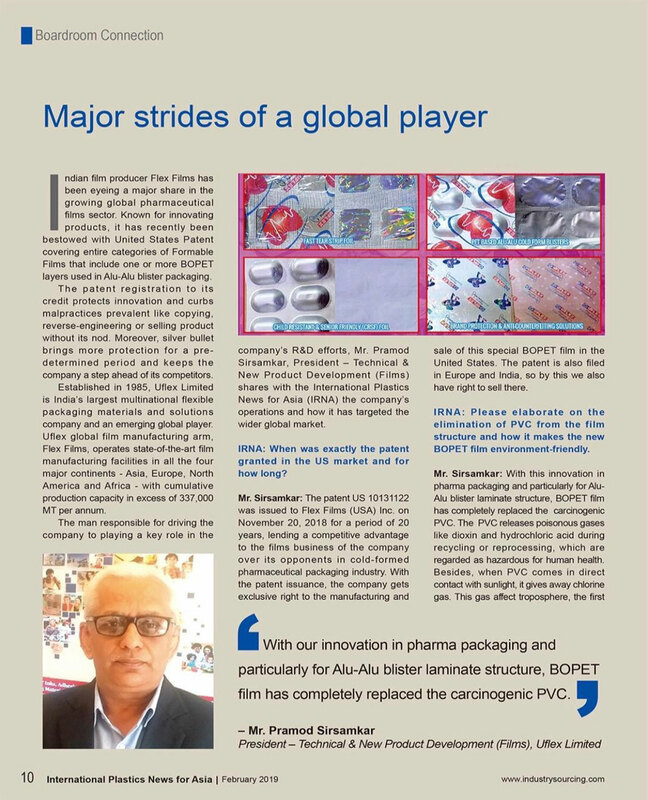 The global pharma packaging industry is booming with modernization, courtesy several drivers in the technology innovation segment, with India being the hub of Pharma. At the recently held CPHI India in Greater Noida, a gathering of Pharma manufacturers and professionals from across the world, Indian flexible packaging giant Uflex steered the path of innovation by unveiling a portfolio of its latest products in pharma packaging – Fast Tear Strip Foil, PET based Cold Form Blister, Child Resistant & Senior Friendly Foil and Branding Solutions – for pharmaceutical companies.